Animated films walk a fine line between the jubilance that appeals to a younger audience and the nuanced artistry that'll rope in older viewers. It's a balance largely mastered by certain renowned studios -- from Disney and Pixar to Laika and Cartoon Saloon -- yet others struggle to seamlessly bring together the two, resulting in films with either too strong of a silliness factor or too subtle and mature of a demeanor to hold the interest of children. Imported from France's On Entertainment animated studio, Mune: Guardian of the Moon doesn't attempt to restrain its storybook poeticism engineered for youthful captivation, nor does it veer away from concocting a gracefully-paced, pacified imaginative viewpoint that'll draw in the mature cinema lovers out there. Bravely pushing in both directions instead of attempting to find a middle ground, it also suffers the pitfalls of doing so, resulting in a gorgeously lyrical adventure with superfluous immaturity and sleepy wandering through its visual splendor. Taking place in an alternate realm, the story gravitates around the cycles of day and night, which pass as two giant beasts gradually tow the sun and moon in a routine, circular pattern. Each of these beasts, and the celestial body that they're lugging behind their slow treks across the land, are guided and overseen by "guardians": defenders selected during ritualistic ceremonies who serve their respective celestial bodies until old age, across several generations. Predictably, the stout, strapping harpooner Sohone lands the role of guardian of the sun, but the proceedings take a curious turn when Mune, an unseasoned youngling of the bipedal faun population, is unexpectedly selected to become the guardian of the moon above other trained, knowledgeable candidates. 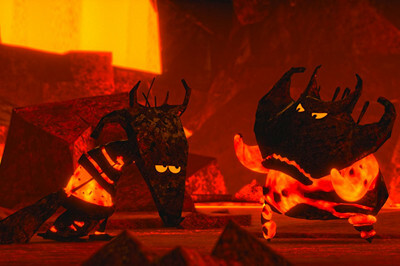 Amid the chaos of the selection, the moon drifts out of their control, sending Sohone and Mune -- along with Glim, a bookish girl made of wax who melts and freezes under slight fluctuations of temperature -- on a retrieval mission to regain control and prevent evildoers, like the lava-dwelling Necross, from obtaining it. Mune: Guardian of the Moon wastes no time in establishing the whimsy of its unique, radiant other-worldly realm, where distanced shots of the planet's rotation and the functionality of its day-night cycles immediately lend it the qualities of a storybook in motion. I'm referring to the visual language here, wherein celestial bodies move across the skyline by strings or chains above idyllic deserts and glowing forests reminiscent of the fairytale beauty within Avatar's Pandora, yet this echoes into the adolescence of the storytelling itself and how the conflict emerges among the planet's inhabitants. Abiding by a system where an untrained youth can be chosen out of the blue to be one of two protectors of the life-sustaining day and night cycles, the script's selection of this unlikely hero taps into too much juvenile empowerment fantasy, unconvincingly meshing with the scope of the guardian's duties. There's artistry involved with establishing the universe here, and it's undermined by how carelessly those who populate it are with choosing its protectors, ignoring the middle ground between experience and naivete. Since this lack of knowledge and capability results in the realm's cycles being thrown off, Mune: Guardian of the Moon doesn't make it easy to stay absorbed on a deeper level with the challenges presented to the young overseer of the moon. The film's visual language works overtime to deepen the experience: little white fuzzy creatures that look like the inverse of Spirited Away's soot sprites neutrally observe Mune as he jumps headlong into the harpsichord-like apparatus that navigates his mammoth creature, creating subtle scenes of chaos as he struggles to maintain control while bathed in moonlight. It's the kind of scenario that would've been avoided had he prepared at least a little for the job, and no amount of psychedelic, Bruce Almighty-esque manipulation of the moon's placement can distract from that. Maybe that's part of the plan, to form a cautionary tale around the damage that ignorant, unqualified leaders can impose on their surroundings, yet how the laws of the universe and changes in perception through experience could right things after learning from their blunders. Or not. Regardless, the messily-executed themes of responsibility and overlooked ability within Mune: Guardian of the Moon weigh down the resulting adventure, one that forces reluctant cooperation between two drastically different types of hero in order to fix their monumental mess. Neither are prepared for what lies ahead -- despite being groomed, Sohone never bothered delving into celestial texts; despite yearning for a purpose, Mune never cracked a book, either -- yet that lack of preparation could've become a unique factor of their characterization had there been more to their personalities. Instead, both fall into that one-note territory expected of a children's storybook narrative: one displays strapping arrogance that'll get him into trouble and dim with time, while the other possesses insecurity, curiosity, and hidden strength that'll brighten with time. The most interesting character of the lot ends up being Glim, the studious girl made of wax who braves the elements to assist and educate the pair of guardians, though the existence of animated wax people who can be remolded if they melt doesn't make much sense in this universe. It's too bad that there isn't more integrity behind the conflict that's created in Mune: Guardian of the Moon, because the storytelling shows a daring willingness to go in gloomy, unexpected directions with the repercussions of mistreating the sun and the moon. There's peril involved that pushes the boundary of youth-oriented storytelling, hinged on failure, mortality, and the persuasive nature of evil, displaying a dash of avant-garde bravery as the visual style also shifts to two-dimensional, standard animation. 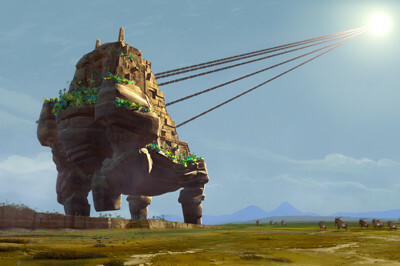 Instead of exploring the aftermath of apocalyptic threats, however, the film plays it safe by treating these as merely larger, more complicated corners out of which this fantastical world needs to be written so it can return to the status quo, propelled by a rapid, dubious expansion of Mune's powers and skill. Contrary to its potential, Mune: Guardian of the Moon transforms into one of those fairytales that unfairly restrains the established powers of villainy -- mind control and sad excuses for henchman -- to uplift its objectives, resulting in a vivid, endearing, but clumsy cycle of mature risk-taking and puerile retractions. Mune: Guardian of the Moon isn't short of beauty, from the creature designs to the sprawling landscapes in the idyllic environment, full of vibrant colors across the spectrum and a plethora of fine details in the fantastical trappings of the world. Universal's team-ups with GKIDS have routinely been fantastic, and this 2.35:1-framed, 1080p AVC transfer doesn't stray from that path, telegraphing everything you'd expect from contemporary digital animation on Blu-ray. Pretty much every color of the rainbow stands prominently in the transfer, but the visual language of the film gravitates toward the confidence of fire shades, the supple blues of moonlight, and the lushness of foliage greens, all of which are on bold display yet sport tremendous gradation into shades of orange and yellow and into deeper purples and grays. Fur, stone, and waxy texture exhibit faultless sharpness, while the traditional animation segments capture the distinctive roughness and "strokes" with precision. Contrast levels create immense depth of image, without oppressing the image with heavy shadows. Everything's simply beautiful. Dual audio options are available here, both in the original French language and in an English dub featuring surprisingly popular talents for how under-the-radar this film ended up, including Rob Lowe, Ed Helms, and Christian Slater. Both tracks sound sublime in 5.1 DTS-HD Master Audio, sporting a lot of really interesting bass response due to the persistence of the large creature footsteps echoing throughout the realm, which tests both the lower-frequency response and the sprawl of the surround track. Intricate higher-end details arrive in the plucking of harp wires, the rattle of chains, and the sizzle or frosting-over of Glim's skin when she interacts with the elements. Surround atmosphere is generally reserved for enriching the ambience of the atmosphere -- flame lapping, forest chatter, spiritual wispiness -- but it's consistent in how it implements the spread across the stage, locking an engaging environment. The discernible difference between the tracks comes in the dialogue, and not just the language: the original French language track integrates more fluidly with the effects than the English track does, though that's part and parcel with dubs themselves. Either way, Mune sound phenomenal. Apart from a Theatrical Trailer (:43, 16x9 HD) that lasts less than a minute, a pair of extras have been made available with Mune: Guardian of the Moon. While short on numbers, and with The Art of Mune (2:47, 16x9 HD) just being an in-motion image gallery, the primary French-language featurette delves thoroughly into the conceptualization of the project. The Making of Mune (43:13, 16x9 HD) progresses in chapters, which easily could've been separated into many different extras if they really wanted to convey quantity: after some general discussion, the topics are broken down into Design Research, Inspirations, Visual Style, Characters, Music, Traditional Cartoons, and concluding things with A Unique Film. With production sketches and visualizations playing between interview stretches with Benoit Phillipon and his crew, this forms into a fairly comprehensive -- if slightly routine and protracted -- glimpse at the work poured into the project. Mune: Guardian of the Moon commands attention with its beautiful, fanciful aesthetic and mythical premise, hinged on protectors of the day-night cycle who are selected by virtue at a ceremony, bringing together thriving worlds of both sunlight and moonlight for the occasion. When Mune promptly loses control of his particular celestial body, a broad adventure ensues to retrieve it, prompting the drastically different guardians -- and a noteworthy tagalong, a girl made of wax who's more prepared than either of ‘em -- to wrangle it back under their control. Striking visuals mesh with a whimsical fairytale narrative and a willingness to push the boundaries of what could be viewed as a children's film, but the components can't mesh together into a sensible story, hindered by the unlikely process of selecting the guardians and the rapidity in which they evolve into worthy protectors. Universal and GKIDS knock it out of the part with a brilliant Blu-ray, both in terms of audiovisual delight and a strong 45-minute making-of featurette imported from overseas, but the frustrating underpinnings of the story keep this one as a Rental.